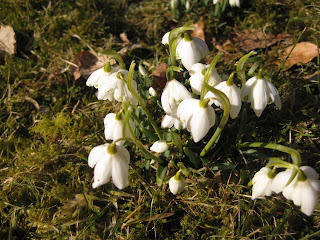 Notes from a Lake District Garden: Snowdrops revealed, but deer let in. Snowdrops revealed, but deer let in. We've just had the beech hedge around the side garden cut back. It had become very overgrown, and hung out way past its roots. The good thing is that we can now see snowdrops that have been hiding there unseen. The down side is that the deer and sheep can now walk much more easily into the garden, as huge gaps have opened up where previously there were small branches. Just seen a red squirrel- good news! The deer have been busy whilst we've been away.